Wilsonville Spokesman Newspaper highlights Healthy Grocery Girl client Claudia Harris and her 50 pound weight loss, working HGG R.D. Megan Roosevelt. Gaining her own nutrition education Megan Roosevelt (pictured right), owner of Healthy Grocery Girl, worked with Claudia Harris in not only helping her lose 50 pounds, but in changing the way she approached food and exercise. Americans have a great need for nutrition education. Claudia Harris will be the first to tell you about it. Over the past year, the Wilsonville resident lost 50 pounds and gained a new perspective on healthy eating, cooking and living. Helping her get there was Megan Roosevelt, a local registered dietician who took on Harris as a client through her business, Healthy Grocery Girl. Together, they identified goals, looked at changing habits and kept in touch along the journey. Harris understands and has lived that philosophy over the past year. After retiring from her desk job with the city of Tualatin, Harris put a healthy lifestyle on the top of her priority list. 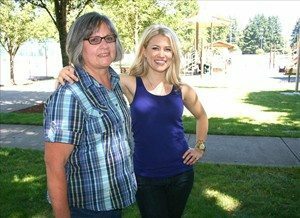 She began working with a personal trainer at the Wilsonville Community Center and joined Weight Watchers. That effort resulted in a 20-pound loss. But Harris felt she could do more and responded to one of Roosevelt’s advertisements. “I liked Weight Watchers, but I felt that there was not enough detail on what to eat,” she said. Because some people don’t even know where to begin in their journey, Roosevelt often starts with a “healthy kitchen makeover” and guided shopping trips. She also does personal grocery shopping and delivers health registered-diet-created meals delivered to their home or office. Harris’ first step was to keep a food diary, followed by cleaning out her kitchen. Roosevelt said the kitchen cleaning is a tool to make a break from old habits. Because Harris already had some success with exercise and weight loss, she felt she had that “readiness to change” that Roosevelt has said is so important. Roosevelt said she’s still trying to get Harris “in the pool,” but it’s not working. Roosevelt, whose clientele includes both genders and ranges from families to busy professionals and recreational athletes, said their goals are typically to lose weight, learn healthy eating habits, learn how to cook and shop for healthier recipes and foods, improve their overall nutrition or receive nutrition care to help manage diseases. To help clients, there must be a “readiness to change,” and the more that’s present, the more successful a person will be. Harris said she appreciated having someone accessible at all times for support and accountability. It also helped when Harris had surgery earlier this year and had to put her exercise routine on the shelf as she healed.